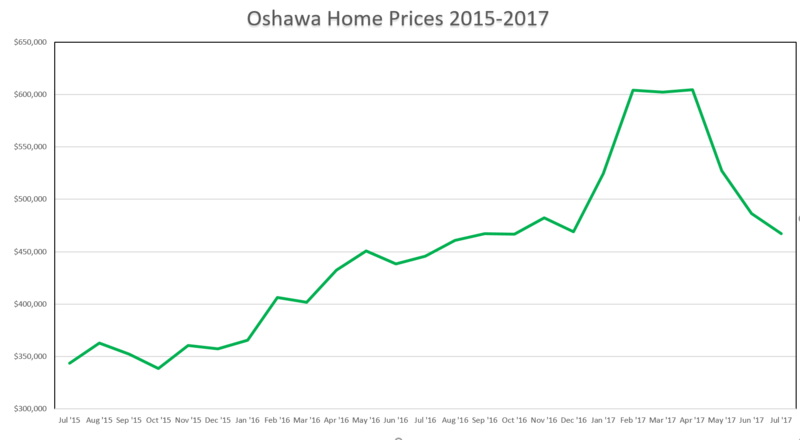 Oshawa's real estate market continued to cool down from one of the hottest spring markets ever. Although prices are still up from last July, a boost in inventory has made things very attractive for buyers that have been sitting on the sidelines waiting for an opportunity to get into the market. Prices made just a 4.6% average annual price gain in July 2017. The Toronto Real Estate Board's (TREB) latest market statistics show the average Oshawa property at $467,057 - up from last year's 446,441, but down from last month's 486,555. Sales volume, however, was down 36.2% with 220 units sold versus 345 last July. The average selling price of homes in the GTA this July was $746,218. This represents a 5.1% increase over 2016. Sales volume was down 40.7%. Active listings within the board increased 65.3%, which shows a shift in market fundamentals. The jump in inventory is helping to make the market more balanced - more inventory means less bidding wars as supply rises. In Oshawa, the increase was 305% with 644 active listings over 159 last year. This helps to explain why prices dropped from spring levels. The increase still isn't enough to make it a buyer's market, though. The average property in Oshawa still sold for 99% of asking. That's still better than the entire GTA - at 98%, and is partly due to Oshawa still having the lowest average prices in the market. While inventory levels did increase, the levels are still low. The current trend shows only 1.0 months of inventory. 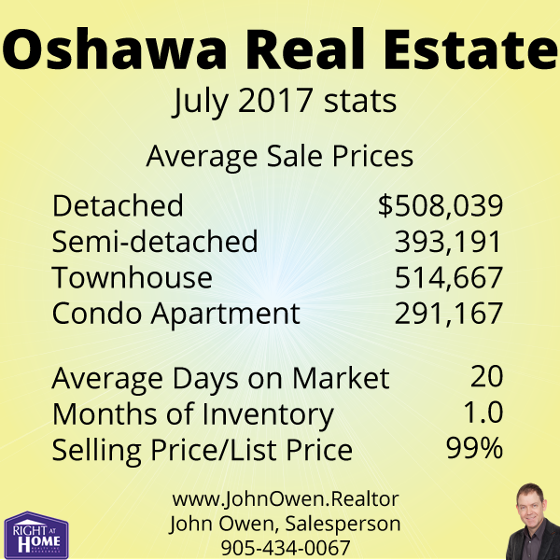 What are homes selling for in Oshawa? The MLS Home Price Index helps to normalize the statistics, by adjusting sales statistics to represent typical homes within MLS areas. 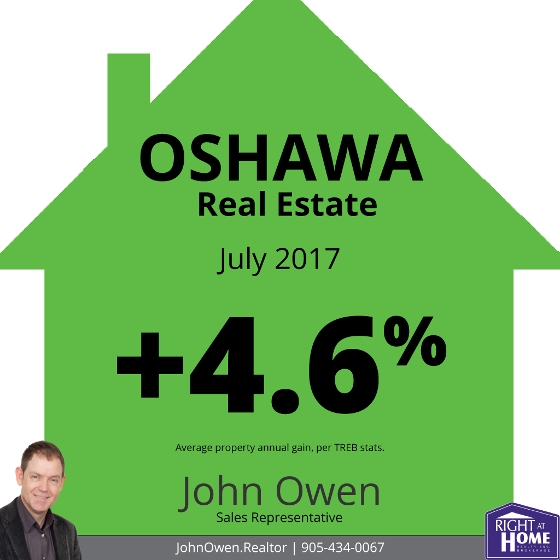 When using these numbers, Oshawa showed a composite annual gain of 23.6%, compared to the TREB average of 18%. Inventory levels continue at low levels with 1.3 months of inventory on hand across the board. This means that a current sales levels, all of the property would be bought up in the GTA in 1.3 months (if no new listings were added). 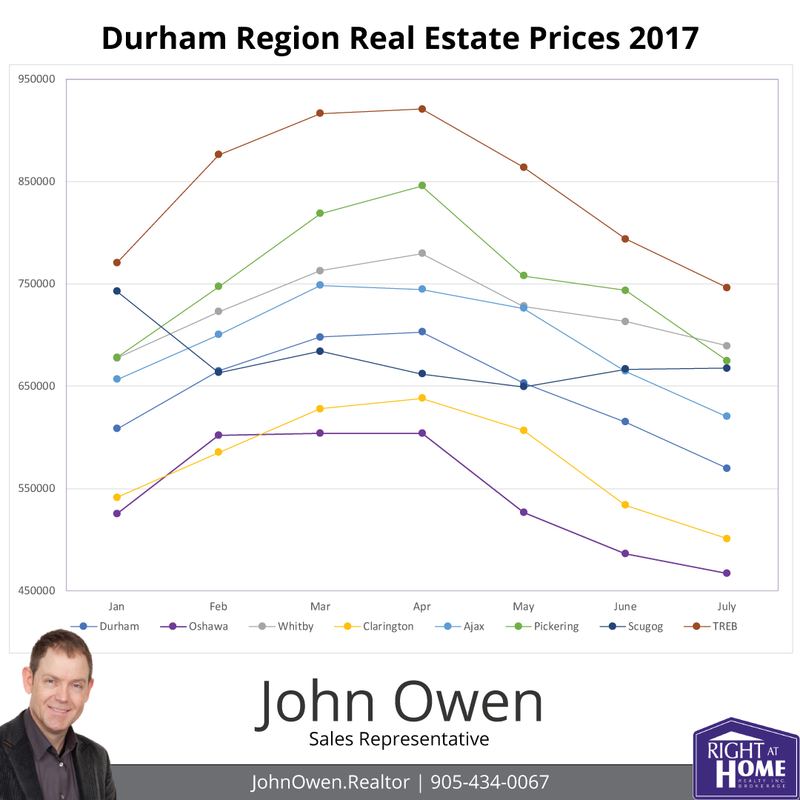 Many areas within the GTA have similar figures, but Durham Region still has the lowest inventory in the entire area. Overall, there is only 1.0 months inventory in the area. In Oshawa, there is just 1.0 months inventory. Some home price ranges and types are still experiencing bidding wars. The average listing in Oshawa spent 20 days on the market. The TREB average was 21 days. If you are interested in seeing values for an area not shown, or are interested in other figures, please comment below or send me an email - John@JohnOwen.Realtor As always, give me a call anytime if you would like to discuss further without any obligation. Member, Canadian Real Estate Association (CREA), Ontario Real Estate Association (OREA), Toronto Real Estate Board (TREB).